Project management involves planning, gathering, and organization of resources necessary for the successful execution of projects. The task of a project manager is to achieve project objectives and to ensure the completion of the project within the prescribed time frame and the prescribed budget. They learn to plan and manage complex projects, using industry tools and techniques. They learn to incorporate change during the lifecycle of a project. They acquire skills to deal with cross-cultural, political, and social issues impacting international projects. They learn how to lead and work with diverse groups of people. They also gain awareness about incorporating ethics in their communications and activities. Although, admission requirements for the degree can vary from one institute to another, following are some of the key admission requirements. Online masters in project management will help you manage complex projects, balance the demands of quality, time and cost and help you facilitate relations between the customer and the project team. This course enables students to study management issues related to assessing risk environments present in both private and public sectors. It includes topics such as elements of risk assessment and operational continuity, project management framework of planning, organizing, and controlling. Students also learn about the role of firms in crisis management and response. Besides, they study systems and interactions that are vital for operations. This course introduces project management students to the concepts, methods, and problems of accounting and financial analysis. Some of major topics in the course include accounting principles, financial statement analysis, measurement and disclosure issues, time value of money, cash flow projection and analysis, capital budgeting and project evaluation, cost of capital and capital structure, and bond and equity valuation. This course examines how businesses can use internet and web technology effectively. It covers topics such as ecommerce procedures, payment methods, applications in different sectors of the industry, security, challenges of starting and maintaining electronic businesses, and comparison with traditional businesses. This course allows students to explore decision making and policy formulation in organizations. Key course topics include goal setting and planning process, rational models of decision making, evaluation of different options, decision trees, cost benefit analysis, uncertainty and risk assessment, prediction of results, and procedures for evaluating outcomes. Project coordinators or facilitators work directly under a project manager. They are responsible for overseeing a certain aspect of a project such as organizing meetings, handling materials, or overseeing team members. Graduates who land a job as a project coordinator can work their way up to become executive level project manager. This job is the first step to becoming a project manager. Individuals with new ideas, an analytical mind, and love for challenging work can enjoy working as product development managers. New product development managers are not only interested in the development of a product but they also have to pay attention to its commercial and marketing aspect as well. Manufacturing and construction are some of the most common fields for project managers, so acquiring experience in this field can be quite fruitful for graduates. Depending on the size and scope of the project, the role of a project manager can vary in the construction industry. Project managers are involved in both small and large projects. 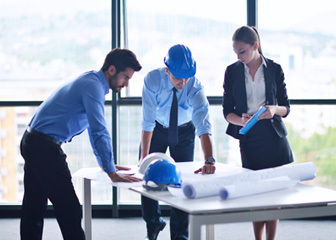 They have to work closely with architects and contractors on larger projects, while on smaller projects they have one-on-one interaction with builders. Information technology is a relatively new career for project managers. Many large corporations require IT departments to deliver a product or perform duties in an efficient and cost effective way. A number of large corporations prefer project managers with an IT background. IT project managers require a very specific skill set and a computer science background can be very helpful in the field. Many companies do not need full time project managers or coordinators. Individuals, who like to work on case-by-case basis and want to work on newer projects, can consider starting their own consulting firm. As a freelance project manager, they can have the freedom to work on projects of their choice and can select projects that are more appealing and rewarding for them. Another option for them is to join an already established consulting group, which can help with experience and skills. Q:What courses will be covered in Project Management master degrees? A:Project Management master degrees covers a number of courses that are designed to help students understand the core concepts of the subject. Courses covered in this program are Statistics for Management, Project Management Finance, Risk Management, External Project Management, Supply Chain Management and Project Management Applications. Prospective students interested in this degree program are advised to search our website for an extensive list of online institutions. Q:What is the total time required for completing a Master in Project Management degree program and how will doing this course online affect the time span? A:A master In project management degree takes about 2 years to be completed if you are physically enrolled in an institute to do so. How long it will take for you to complete the same course online is up to you. the biggest convenience of doing courses online is that the student themselves schedule their classes and tests. So even though you can not complete your master in project management degree any sooner than 2 years online as well, but taking longer than 2 years is entirely up to you. Q:What are the requirements for master certificate in project management? A:The educational requirements for a master's certificate in project management will depend on which school you apply to. Generally speaking you should at least have a four year bachelor's degree on apply for a graduate program. In addition to this schools look for high standardized test scores, personal essays/writing samples and letters of recommendation. Q:Should I go for master in project management online? A:A master degree in project management will allow you to work in a lucrative sector that has some very good job opportunities. Apart from this an online degree has plenty of advantages of its own. An online education allows the student to keep his existing job and to study when he/she wants. It is also more economical as compared to a traditional degree program. Q:Will I be able to pursue a career if I go for an online masters in project management degree instead of a campus based degree? A:Online degrees and campus based programs are equally valued in the employment sector. Now employers do not consider any difference between online degrees and campus based degrees. You will be studying the same coursework in online degrees. Online programs have been proved to be flexible and affordable in today's tough economy. Q:What can I expect to study in project management masters degree online? A:In the project management masters degree online, you will gain knowledge and exposure of a number of courses and activities. You will study concepts, methodologies and analytical techniques essential for effective leadership in complex organizations. The program focuses on problem solving and decision-making using case studies, team work, hands-on applications, active participation, and research.